When we saw the game in action for the first time, it still had some placeholder graphics for the units and animation, but what was already clear is how scalable everything was. It was possible to see the entire map of medieval Europe, and then quickly zoom into a specific country, region or individual town. These are the types of changes in scope that the game deals with as well, since you start out governing just a small settlement and by the end you might just rule major parts of Europe. The way you go about reaching this goal is not through bloodshed, as we’ve seen in many other “grand strategy” games that take place in the middle ages. Total War emphasizes battle strategy, although it also has its fair share of economics and politics. 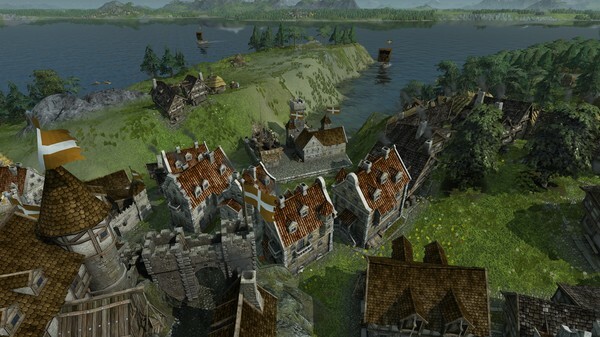 A title like Stronghold focuses largely on building and conquering strongholds, and the Grand Ages series focuses largely on economics and trade. Part of your strategy will rely on where you found your cities. Not just in terms of having access to the best and fastest trading routes, but also to make sure you can acquire precious natural resources – or even monopolize them. Picking what you produce is an important choice when you start out as well, but you’ll never be self-sufficient so there is an immediate need for trading partners. You’ll find these partners in other settlements nearby, and over time they might turn into competition or a target for conquest. Before you even consider those options though, you’ll want to build some solid foundations for your economic empire. This’ll allow you to bring another settlement’s economy to a grinding halt if you out-perform them, forcing them to join you instead. Or, if you’re less patient, you can build an army to stake your claim instead. 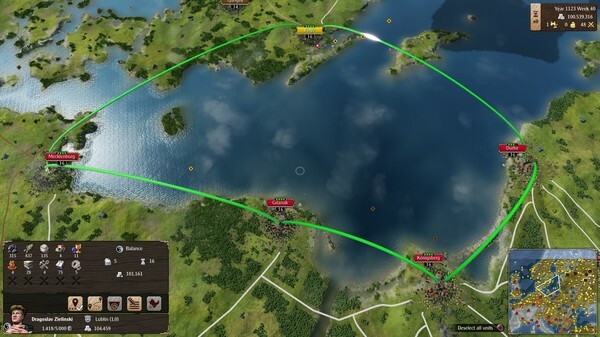 Choosing the military approach doesn’t trigger a battle like it would in Total War – it’s not nearly that interactive. In fact, it’s much more like Civilization, where two armies clash and the stronger one usually wins by default – the battle itself is fully automated and there’s nothing you can do to alter the outcome once it starts. This is perfectly fine though, because Grand Ages’ strength lies elsewhere and a battle sequence like that would drastically alter the flow of the game. There is a tech tree in place as well, which allows you to develop yourself in several different ways – some military, but most of them economic in nature. You won’t just have to deal with opposing economies and armies though – as one of the major settlements in our European network fell to the black plague (and a subsequent hostile invasion). The entire experience is deep, yet accessible – and this why a console version might just work. There is story-driven campaign that is perfect for your first playthrough, since it shows you all of the ropes. Then there’s a more open-ended way of playing as well, although most games will end up unfolding in the same way if you keep using the same play style. This is partly a result of the open ended structure without clear goals, and partly because the conditions upon starting out are always fairly similar. What we liked doing is just set our own goals… like focusing on military might during one playthrough and playing a game of political intrigue the next. What definitely adds flavor to the mix is multiplayer mode – where up to 8 players can strive for European dominance. As is the case in the single player experience, things start out on a rather small scale – and thus will be the focus on most players in the game. Things get really interesting soon though, as trade lines start to intersect, the first settlements get attacked and alliances are (informally) created. While Grand Ages: Medieval allows you to micro-manage a lot of aspects of the game – especially when it comes to trading – you can get by without doing too much of it. This makes the experience just as scalable as the impressive looking map, a potential strategy hit on console and a very good strategy game for pc gamers who are looking for something else than bloody warfare for a change.